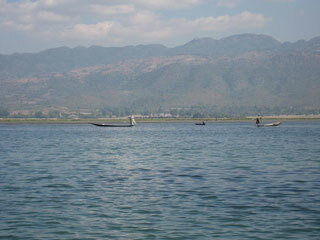 Although Inle Lake is not large, it contains a number of endemic species. Over twenty species of snails and nine species of fish are found nowhere else in the world. Some of these, like the silver-blue scaleless Sawbwa barb, the crossbanded dwarf danio, and the Lake Inle danio, are of minor commercial importance for the aquarium trade. It hosts approximately 20,000 brown and black head migratory seagulls in November, December and January. This article uses material from the Wikipedia article "Inle Lake", which is released under the Creative Commons Attribution-Share-Alike 3.0 License.